Here at ORCA HealthCare we work with countless contractors and plumbers in the U.S. and Canada and have an unrivaled knowledge of the accessible bathing market. Our extensive collection of safe bathing showers and accessories are suitable for a variety of clients and we are always delighted to provide advice or guidance if you’re not sure exactly what you need. 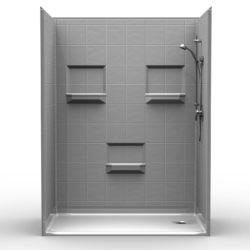 We supply handicap showers to complete your tub-to-shower retrofits in a variety of sizes, including: 60” x 30”, 60” x 32”, 60” x 36” and more. Our showers are available in a range of threshold heights to ensure easy, safe access for your clients. 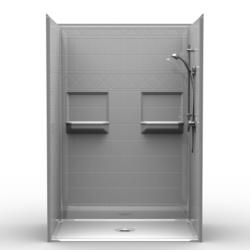 Our roll in shower features a .75” or 1” threshold, while our walk in shower is considered a low curb (1.75” high threshold) or standard curb shower (6” high threshold). 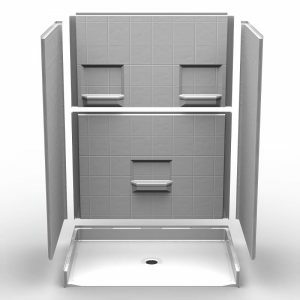 As well as stocking multi-piece showers for bathroom retrofits, we also have a wide selection of one-piece showers for New Constructions, including ADA showers for commercial use. Speed-It-Up Showers ship out next day! If you’re pushed for time, our Speed-it-Up Shower Package is the quickest and most convenient solution to help simplify your remodeling project. 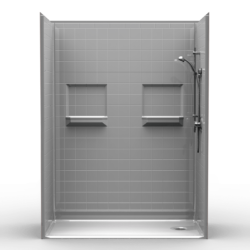 Our fully accessorized roll in shower or walk in shower packages will be shipped the day after you order. Accessories packages include a Delta valve with handheld shower head, grab bars, folding shower seat, curtain rod, heavy weighted shower curtain, drain, and a rubber collapsible WaterStopper. Enjoy the convenience of having everything you need in one crate. 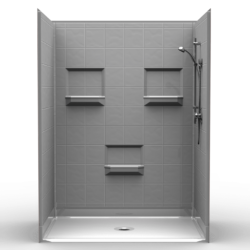 The quality of our products means you will be impressed as soon as you open the shower crate. All walls are a reassuringly sturdy 0.5” thick, and feature a plywood core, enabling you to add safety accessories such grab bars and folding shower seats. Using an innovative clip system, walls simply snap together to ensure leak-proof corners. Shower pans are pre-sloped and the bottoms are leveled during production, allowing you to skip the step of mud setting. 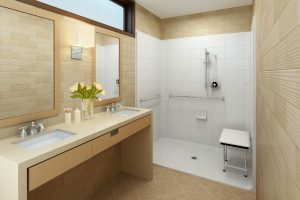 If you don’t have much experience in accessible bathing projects, we can help. 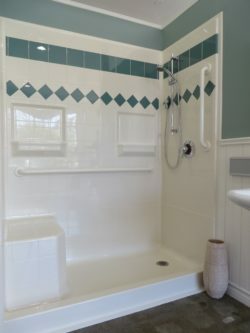 Our shower line is designed specifically to meet the safe bathing needs of seniors and people living with a disability. We can help you choose the correct model to best meet your client’s needs. We supply ADA compliant accessories that can be installed exactly where your client needs them. Our innovative T-shape WaterStopper, with the addition of a heavy weighted shower curtain, prevents splashes and spills from the shower. Boasting a 30-year warranty, the gel coat fiberglass walls are incredibly easy to clean and won’t accumulate mold or mildew. ORCA HealthCare wants you to feel good about your install. Our stylish handicap showers freshen up any bathroom with their beautiful gel goat finish, while we work with you every step of the way to ensure your clients get the safe and accessible bathing they need. You can feel confident about offering your clients a safe, practical long-term solution that will allow them to live at home for as long, and as independently, as possible. The team at ORCA HealthCare are friendly, knowledgeable and able to provide in-depth technical support for any of our products. We always respond to queries as quickly as possible and are happy to provide no-obligation quotes.